Introduced to Congress in May 1989 by Senator Tom Harkin, the Americans with Disabilities Act, or Public Law 101-336, was signed into law on July 26, 1990, by President George H.W. Bush. The official title was "A bill to establish a clear and comprehensive prohibition of discrimination on the basis of disability," and that is what it aimed to do. President George H.W. Bush signs the Americans with Disabilities Act on the White House lawn surrounded by Evan Kemp, the Rev. Harold Wilke, Justin Dart Jr., and Sandra Parrino. On July 26, 1990, President George H.W. 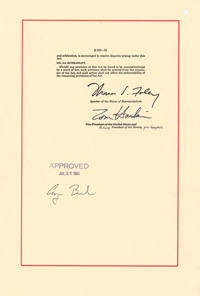 Bush signed the ADA into law on the lawn of the White House. With him on the platform were the Rev. Harold Wilke, Evan Kemp, Sandra Parrino, and Justin Dart Jr., all members of the Disability Rights Movement who had urged the passage of the bill. The law was proposed to remove many of the barriers that blocked people with disabilities from fully participating in society. Since the number of people living with disabilities is so large, and grows every day, it was time for the civil rights of people with disabilities to be addressed. Forms of discrimination against people with disabilities existed despite previous legislation, especially in areas such as employment, housing, public spaces, education, transportation, communications, health care, and public services. 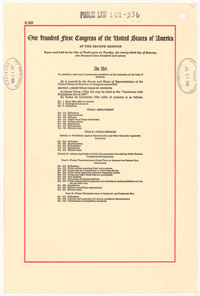 The title page of the Americans with Disabilities Act that shows the sections of the bill and is stamped with the White House RECEIVED stamp. This landmark legislation was decades in the making and eagerly anticipated by members of the Disability Rights Movement. It represented a major step toward the inclusion of people with disabilities in society. Signatory page of the ADA that shows the signature of President H.W. Bush. By signing his name to this page, President George H.W. Bush signed into law the foundation for a great change in society and for people with disabilities. The ADA established the framework for civil rights for people with disabilities to allow them equal opportunities and was based in large part on the Civil Rights Act of 1964. What sets the ADA apart from previous legislation is its broad range of applicability and the definition of disability. Although the definition has been modified since, it acknowledges the wide range of disabilities that exist and applies to any "physical or mental impairment that substantially limits a major life activity." Provisions of the law cover a wide range of issues. Title I addresses employment and states that a business entity must not discriminate against a qualified individual on the basis of a disability. This means that if the individual is able to fulfill the duties of the job, the employer cannot refuse employment because of the disability. Title II requires public entities and programs to provide access to people with disabilities. Title III states that individuals cannot be discriminated against because of a disability by a place of public accommodation; facilities that are open to the public must remove architectural barriers to the best of their ability so that everyone can enjoy the services, spaces, and goods. Title IV requires telecommunications companies to modify their services to be accessible to all, especially people with hearing and speech impairments. With the passage of the ADA, the civil rights movement expanded to include the largest minority in America, people with disabilities. It has led to drastic improvements in the built environment, allowing more people to participate in society and to communicate fully. The Americans with Disabilities Act stands as one of the most important documents in the civil rights movement in America for its far-reaching implications.